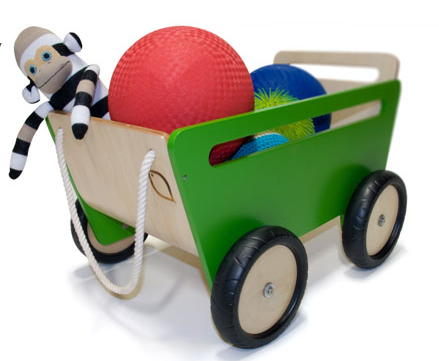 I just checked back in at Giggle.com– one of my favorite sources for cool children’s gear and gadgets. They have a bunch of items that are exclusive to the site, which means you won’t be seeing everyone with the same things! 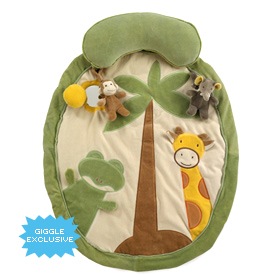 Here are my two favorites: the organic jungle mat- $80, and the organic cotton bowling buddies set- $45. January 29, 2010. 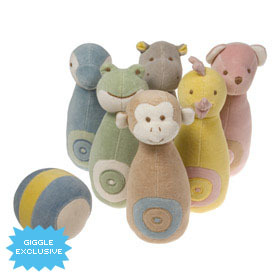 Tags: baby jungle mat, exclusive toys, giggle exclusives, giggle.com, kids bowling set, organic cotton bowling set, organic cotton kids. Uncategorized. Leave a comment. I have been on Oahu for not even 1 full day and I am already in Aloha mode. It is always so strange to come back to a place you used to live and see all the changes that have been made. But, many old staples remain. I stopped by Teddy’s, my favorite burger joint, to grab lunch. Inside, I noticed a mom with three children- none of which were wearing shoes. Okay, I know this is Hawaii, but I still felt a tinge of grody- ness. The thought of tiny barefoot feet on a fast food joint’s floor- ugh! This made me think of how handy a few pairs of Bical shoes would be- they can be worn from the street to the shore’s edge…and who doesn’t love the cutesy, fun prints? January 28, 2010. 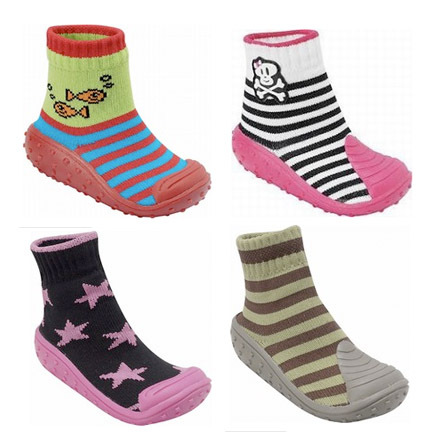 Tags: aloha, bical shoes, bical water shoes, cute water shoes, fun print shoes, kids water shoes, the baby marketplace, water shoes. Uncategorized. Leave a comment. I am currently in an L.A. state of mind- most likely because that is where I have been waiting for the past couple of hours for my connecting flight to Oahu. I figured, why not do a post on one of my favorite L.A. based companies, Entertaining Elephants. January 27, 2010. Tags: entertaining elephants, fairy skirts, hawaii bound, los angeles state of mind. Uncategorized. Leave a comment. It’s official, I have been bitten by the travel bug! 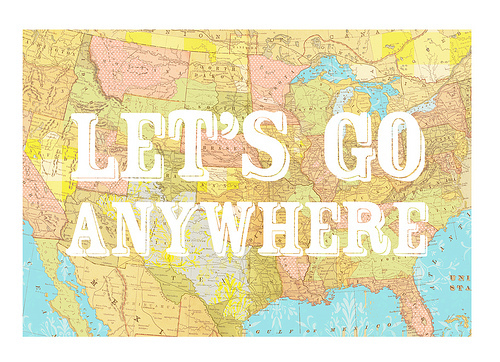 If money weren’t an issue, I would be non- stop discovering this world and all it has to offer. Luckily, being freelance allows for some flexibility in that area. So, tomorrow morning I am off to Hawaii for a month! I will be on Oahu for a week, and Maui for three! One of my besties, Tammie, is currently pregnant and due in early February. I am going to help her out with anything she may need, and do some discovering of my own on the side. I will still be posting regularly, so make sure you keep checking back! January 25, 2010. Tags: Hawaii, inspiration travel, oahu travel, travel bug. Uncategorized. Leave a comment. The current situation in Haiti right now is downright devastating. I am asking you to please try and do as much as you possibly can- whether this mean donating to the numerous organizations (Red Cross, Doctors Without Borders, Oxfam America to name a few), purchasing products from companies that donate proceeds (like this adorable onesie below from Etsy, $12), or even something as simple as praying- it can all do wonders. January 23, 2010. Tags: doctors without borders, etsy haiti, haiti onesie, help haiti onesie, hope for haiti, naomi cayne etsy, oxfam america, red cross. Uncategorized. Leave a comment. Happy Friday! Hope everyone has some exciting weekend plans. January 22, 2010. Tags: brooklyn apartment, happy friday, kaiku, kaiku design, kaiku wagon, moving out. Uncategorized. Leave a comment. Cool Mom Picks and Etsy have just teamed up to host a Valentine’s Day card contest! Being a BIG fan of February 14th myself, I had to enter! The winners will have their cards made available for downloadable purchase with 100% of proceeds benefiting the Children’s Heart Foundation. Here is my entry below, and make sure to check back next week to see who the winners are (cross your fingers for me!). January 21, 2010. 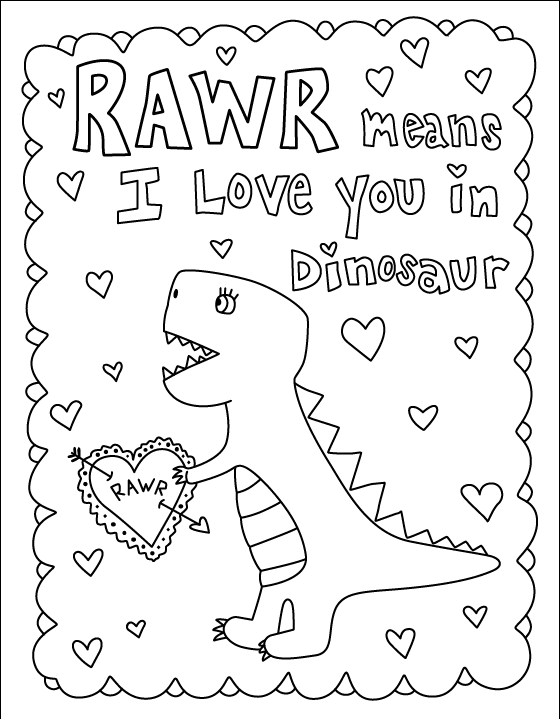 Tags: children's heart foundation, cool mom picks, dinosaur card, Etsy, t-rex and me, Valentine's Day, valentine's day card, valentine's day card contest. Uncategorized. 1 comment. 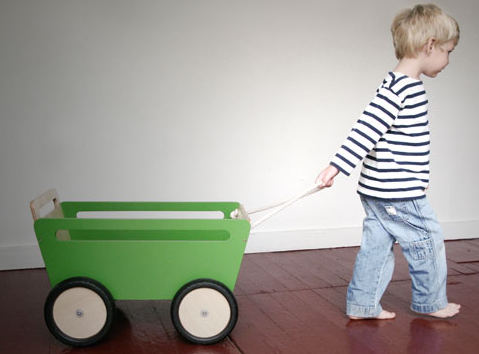 Petit Bateau’s current online sale is anything but petit! The plaid snowsuits I noticed a few months ago (and seen below) are 50% off! 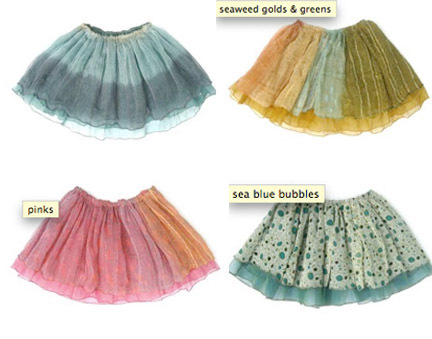 Snap up the stylish duds before they are all gone! January 21, 2010. 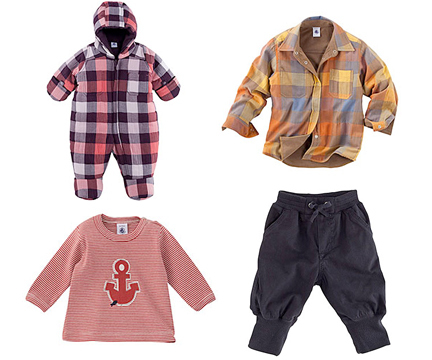 Tags: kids online sale, petit bateau, petit bateau kids, plaid snowsuit, sale petit bateau. Uncategorized. Leave a comment. 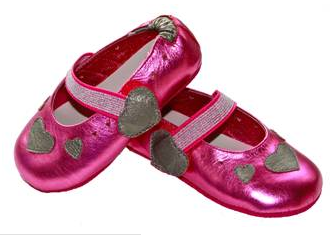 I just received word today that Sweet Shoes, maker of super soft children’s shoes, will be debuting 2 pairs of limited edition metallic maryjanes in honor of Valentine’s Day. Now, the only problem is trying to decide which ones I like better! January 21, 2010. Tags: heart shoes, maryjane shoes, metallic maryjanes. 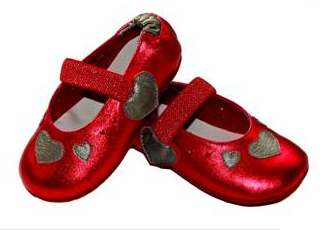 kids maryjanes, sweet shoes, valentine's day shoes. Uncategorized. Leave a comment. I came across Catherine Fitzsimmons’ company, Rikshaw Design, and loved the beautiful, block print bedding designs. All of the patterns exude feelings of serenity that are sure to bring cheer to any baby’s room. You can also mix and match prints which is always appreciated. January 19, 2010. 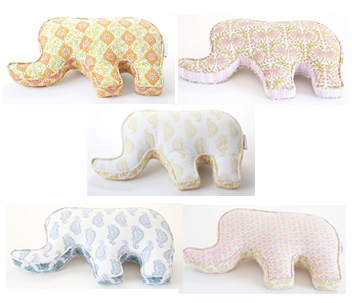 Tags: adorable crib bedding, baby bedding, block print bedding, catherine fitzsimmons, elephant pillows, indian baby bedding, indian bedding, rikshaw design. Uncategorized. 1 comment.